Accidents happen during home-improvement projects, even in space. The mishap unfolded on the International Space Station, which orbits about 250 miles above Earth, circling the planet every hour and a half. Earlier this month, NASA astronauts had gathered in the bathroom to install a pair of stalls for an extra enclosure that would provide some more privacy. As they worked, they twisted off a metal bit that connects a water unit to a hose that astronauts use for toothbrushing, bathing, and other hygiene routines. And that’s when two and a half gallons of water came bursting out. The crew responded as they would on Earth: They grabbed a bunch of towels and scrambled to mop up the water. They attached a new bit to the unit and completed their work. The incident was detailed in one of NASA’s daily dispatches that describe events on the ISS. History has treated astronauts as nearly mythical figures, but their day-to-day activities are usually quite tedious. The thought of them frantically trying to stop a leak in the bathroom makes them wonderfully relatable. But a plumbing accident in space has little in common with one on the ground. For starters, there’s the feeling of weightlessness. (Technically, astronauts are subject to 90 percent of the gravity that we feel here on Earth, but the station’s brisk traveling speed of 17,500 miles per hour keeps everything on board in a constant free fall that resembles zero gravity.) The ISS is equipped with handrails and footrests so that astronauts can push themselves around the station or stay in one place while they’re working on something. Tools can drift away and out of reach. So can water. Unleashed in weightlessness, water behaves like soap bubbles blown from a wand. Water molecules are more attracted to one another than molecules of another substance. They like sticking together. On the ISS, that means water molecules pull themselves together into a shape with the least amount of surface area: a sphere. But unlike its soapy counterpart on Earth, this kind of bubble doesn’t pop and vanish. There is no photographic evidence of the leak, according to a NASA spokesperson. To imagine how it may have transpired, I reached out to Tom Jones, a former NASA astronaut and the author of Ask the Astronaut: A Galaxy of Astonishing Answers to Your Questions on Spaceflight. Jones flew on the Space Shuttle three times before the program ended in 2011. He hasn’t spent any time on the ISS—he helped assemble the station during his last mission in 2001—but he has experienced firsthand the strange phenomena of water in microgravity. Jones says the first scenario is preferable. It would be easier to chase after fat globs of water than tiny beads. Water, like most earthly comforts, is a precious resource on the ISS. The loss of two and a half milk jugs’ worth of water seems concerning. But none of the liquid was actually wasted. The crew left the soaked towels out to dry, and the water eventually evaporated. The systems that control the station’s temperature and humidity sucked up the moisture and dumped it back into a mechanism that produces potable water. 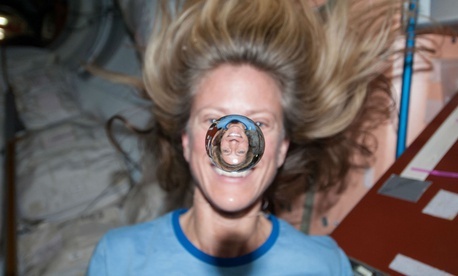 It is thanks to water’s unpredictability in space that there are no faucets or showerheads on the ISS. Astronauts use squirt-gun–like hoses to dispense and carefully distribute water onto washcloths and toothbrushes. Showers are a distant daydream. There’s no toilet flushing, either. Contrary to some news reports about a leaky toilet, the toilet system on the ISS doesn’t use water. Astronauts urinate into a hose with a special funnel on top. (Don’t worry, everyone gets a personal funnel.) They flip a switch to activate a fan in the tube, and the liquid is suctioned away. For solid waste, astronauts stick their feet into stirrups and sit down on a typical toilet bowl. Urine is recycled in the station’s life-support systems and converted into drinkable water. The rest takes a rather dramatic journey: Solid waste is sealed in plastic bags or metal containers. Astronauts eventually transfer the waste, along with other trash, to departing cargo ships. The ships undock from the station and fall back to Earth, where they burn up in the atmosphere like a meteor shower. Astronauts upgraded the bathroom area this month as they wait for a brand-new toilet to arrive in 2020. Their current commode is a Russian-designed system that the United States bought from its partner on the ISS for $19 million in 2007. NASA promises that the new toilet, designed by an American company, is “simpler to use” and “provides increased crew comfort and performance.” The agency also wants the model to work in other, future space habitats. Using the new toilet will likely require some preparation. Astronauts throughout history have received extensive training on the myriad spaceflight systems, the lavatory included. In the Space Shuttle days, astronauts had to practice using the toilet before they launched. The simulator came with a video camera at the bottom of the bowl, pointing up. Astronauts plunked down on the bowl, peered at a television monitor in front of them, and watched themselves, in real time, wiggle around and rehearse the proper placement. “You had to be serious about it, because if you didn’t get those fundamentals down, then you’re going to make a mess for you and your crewmates up in space,” Jones says. But it was still awkward. “The constant fear we all joked about was that that screen of your bottom being displayed on the simulator was also being piped over to mission control,” he says. As far as leaks go, the recent watery fiasco is pretty tame. Last summer, crew members discovered a small hole in the Russian section of the ISS that had leaked air out into space, temporarily causing the air pressure inside the station to drop slightly. The incident drew considerable interest from the public, especially when the head of Russia’s space agency suggested that the hole may have been drilled deliberately, before or after that segment launched to space. NASA dismissed the sabotage rumors. Officials have yet to provide an explanation. The crew wasn’t in any danger. The Russian cosmonauts patched up the opening soon after it was found, using sealant and gauze on board—just another instance of some DIY in space.